Who is your favorite Girl Of the Year? Do you think that AG should retire the friend dolls? What doll do you plan on getting next? When and what age did you decide you wanted a doll blog? Did your parents say no at first,or were they for it? Hope you have a great afternoon/evening!! do you ever leave your dolls in a dark room. My question is who is you’re favorite doll? What is the best part of having an Etsy Shop? 1. If you could only watch one movie for the rest of your life, what would it be? 2. What is your favorite doll hairstyle? 3. If your doll could talk, what is the first thing you would ask them? 4. What is your favorite doll eye color? 5. Do you play any instruments? I thought of a few more! -how long have you been a Christian? Will you ever customize your next doll? What doll(s) do you want next? Do you have a doll house? If so, can you do a tour of it? So those are my questions! Can you please check out my new blog? I’m not sure if you saw it yet, but thanks if you did! Just click on my name. besides american girl, what brand of dolls do you like? where do you keep all your dolls stuff? how old were you when you started an etsy shop? were your parents for the idea of an etsy shop, or against? i noticed that you jut recently started taking pictures outside. do you like it better then taking them inside, or do you find it too difficult? When you are thinking of doing a hairstyle on one of your dolls, which one would you generally pick? 1. If you had to give away all your dolls, but one, which one would you keep? 2. Do you like BeForever? Please answer the questions and nominate other blogs. Thanks! Who is your favorite historical character? When and why did you get into dolls? What are your favorite book covers that they made for the Historical Characters? What is your favorite Historical Character doll? 1. In your opinion, wich one of your dolls has the best hair for styling? 2. If you had 1000$ to spend at any store, what would you buy? 3. 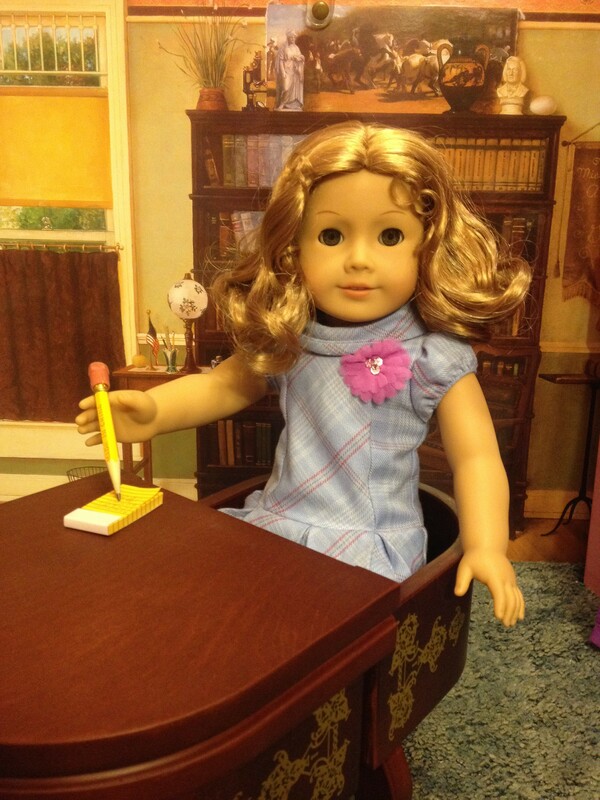 What is your favorite thing about American girl? 4. How did you find out about American girl? Sorry if that’s too many questions, I couldn’t decide on just one! I forgot one question: Do you leave your dolls all over, or are they almost always in one place? Have you ever played any sports? If so which ones? And what was your favorite? Which doll do you want next? Which AG would you like to have come out of the archives? What AG is your favorite? Do you like any doll companies other than AG? What are some of your favorite dolls that you don’t have? Have you ever had a cat? 1: fav. band/singer. 2: fav. book(s)? 3: which blogger would you meet if you could meet one? Will you be doing the Snowflake Award soon? I actually don’t participate in the chain awards that just keep going on and on. This is nothing against you or your award (I think it’s awesome that you made your own by the way! ), I just don’t take part in these awards. 3— do any of your dolls make you really happy when your sad? 1. Do you plan on making another photo story series? 2. What would it be about? 3. What do you enjoy about blogging? When did you find out about American girl?I found out in 2010, December, with my first catalog. When did you first learn how to crochet? My mommy is teaching me. Who taught you how to crochet? Oh, and who is your favorite band? Favorite singer? Mine is Taylor Swift. Are you a neat freak, or are you messy? What’s your favorite Historical Character? Do you like acting, or do you have stage fright? I love acting! I know it’s Saturday, but the answers aren’t posted yet, so I figured I’d ask a few questions. 1. How old were you when you started crocheting? 2. What inspired you to learn to crochet? 3. What is your favorite thing to crochet? Oh, and what is your favorite book? And/or book series?I can’t choose just one series/book!!! Hey! So, WHAT’S YOUR FAVE DOLL COMPANY? Do you plan on getting any more american girl dolls? What is the number one thing you want to get from AG’s new releases? If you could have a AG doll house, what do you think your favorite room would be? Hi, my question is how when and why you found out about American girl and do people u tell people that u like dolls and if so what is their reaction? Thanks and I hope u baseless this question in ur Q and A HAVE a great day. Hi!! So here are my questions!! How do you earn so much money for buying dolls? Do your parents and siblings sipport your interest in them? Do they ever get mad when you continually buy dolls? How can I take care of my African american bitty girl’s hair? Can you make a YouTube video or a post on crochet tips? Have you ever been really mad, and then you looked at one of your dolls and thought, “it’s just a doll”, and then that made you even more mad? I did that once, and have always wondered if other people did it!